So, what I have is an expansion of UN Charter Article 42. Which allows the UN Security Council to create other organs (their term for sub organizations) in order to maintain world peace and security. I am contemplating calling this new organ "InGendarme" sort of a play on InterPol. Players' characters will be a member of this group, they will be responsible for keeping the peace using Epic Fighty Robots. Conflicts will be resolved by throwing a pool of dice and assigning one to each of the following stats: Accuracy, Power, Evasion, and Defense. 1) The GM will explain the phase the players are in (Exposition, Investigation, Planning or Battle). 2) For each phase, the Players need to submit an "Idea" (For the Exposition Phase, the Idea is a Fact in this conflict - e.g., India wants all countries to disarm their Epic Fighty Robots). 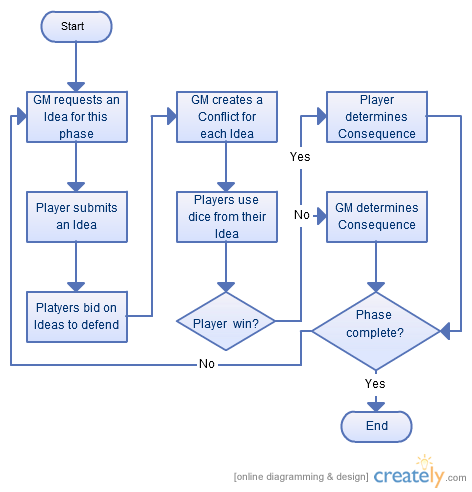 4) The GM will frame a conflict around each idea involving the Idea itself and the Idea's defender. 5) Players can use the Tokens bid on the Idea they submitted to get bonus dice to defend the idea they are Defending. 6) If the Players win the Conflict, they get to determine the Consequence of defending that Idea. Otherwise, the GM decides (e.g., in the Exposition Phase, the consequence is the Threat to InGendarme and their current mission). Also, do you prefer InGendarme or World Police or? Interesting; I am using a somewhat similar system in one of my current designs and I took a slightly different approach that might be useful. 1) Propose 1 Idea per person at the table. 2) Each player can defend one idea, or do something for another benefit. 3) Whatever ideas are left over, are destroyed. It might be working on a larger scale then you are thinking of, but I wanted to give you food for thought. That's pretty cool. I wanted there to be a motivation to come up with ideas that would appeal to the group. Getting bonus dice for that was a good solution for me.